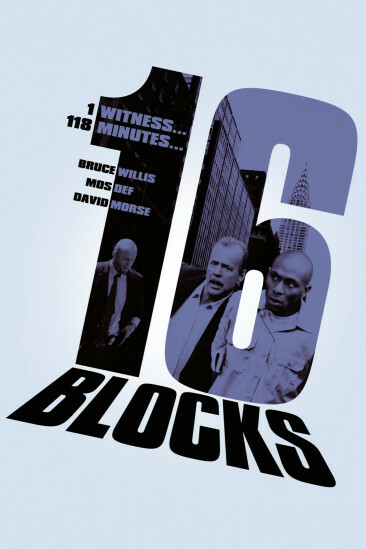 16 Blocks goes on for eight blocks too long. Donner, the director behind 'Lethal Weapon', can make a buddy cop film like a child can draw a stickman. It is his bread and butter. The filling in this action dramatic sandwich though tastes like vanilla. The premise, characters, action and editing are all too bland, and that is Donner's downfall. It's just absurdly easy and straight forward, and that's not even when comparing this to his other films. An alcoholic officer is tasked with delivering a witness to the courthouse by 10am, however he is quickly pursued by a whole department filled with corrupt cops. They must now make their way through sixteen blocks and, well, to be honest the amount of blocks and streets has nothing to do with the story. The tension and excitement does not ramp up as they get closer to the courthouse (or even the deadline for that matter). There aren't many scenes to this generic "Willis shoots the bad guys" drama that will have you on the edge of your seat. The hostage scenario on the bus elevated the stakes somewhat, and the final scene involving a sniper retained some tension. It's not the action that drives this film, it's the chemistry between the two leads and unfortunately only one individual felt interesting. Willis' disgraced behaviour was well performed and gave his character some depth. You could physically see him change and face up to his regretful decisions. Mos Def on the other hand...yikes! What an irritating high-pitched fellow he is. He reminded me of a man child wanting to "bake cakes because everyday is a birthday somewhere!". That's not endearing, that's more of "awww it's ok. Here have a lollipop!" kind of sympathy. Morse is consistent as always and brings dimensionality to his corrupted character, with a few exchanges with Willis that certainly held my attention. It's all very watchable, but there is no bite. No spice. Nothing to make it stand out from the saturated genre that it currently resides in. Talk, shoot, run down the street and repeat. It literally went on forever!